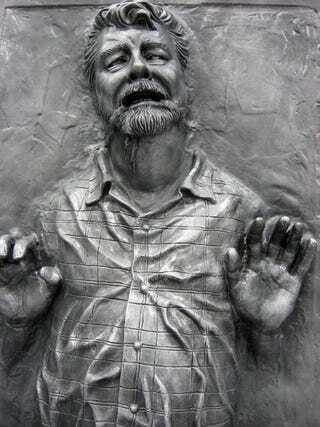 True story: George Lucas owed us some money and he wouldn't pay. So now we have the best office decoration ever. And until Carrie Fisher shows up in a metal choker and a bikini, we're not giving it back. Those are our terms, and before anyone tries anything funny, remember that like half the Gizmodo staff knows karate-or as we call it at the dojo, karaté.